How Datacolor's Spyder5 brings accurate colour and detail to your images. Monitor calibration rarely makes it to the top of photographers' 'to do' lists. Like the most basic DIY job, it's pretty obvious that a properly calibrated monitor will be worth the effort. But with so many other things to do, it's seldom a task that gets prioritised. The truth, however, is, that when you’re viewing an image on a non-calibrated monitor, you’re simply not seeing the true image; you might be missing crucial detail, or not seeing colours the way they should appear. After all the hard work you've put in shooting your images, why would you view and edit them on an uncalibrated monitor? 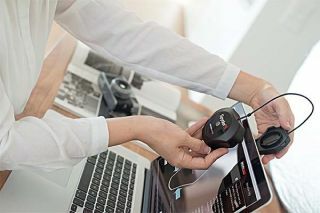 Enter the Spyder5 colorimeter, which calibrates your monitor to the industry colour reference standard, ensuring that you always see accurate colours and maintain all the key details of your photograph, helping you to save time and avoid over-editing. Setting up and using the Spyder5 really is simple. Once unboxed, you just follow the link to download your chosen Spyder5 software (Express, Pro, Elite, Pro+ or Elite+). Then once registered with the serial number, you'll be taken to the set-up wizard which runs you through a step-by-step process to make sure you're ready for calibration. The initial checklist covers whether you have allowed your display to warm up for the right amount of time, checked that no intense light is falling onto the screen, and will detail the monitor settings needed for a successful calibration process. Once you’ve passed the quick checklist, you’ll be asked to plug the Spyder5 into your USB port, confirm your display type, and then calibration can begin. By placing the Spyder5 over your screen in the way demonstrated, you can sit back and relax. Just a few minutes later, calibration will be complete. You'll be invited to name and save the profile, as well as to set up a reminder for a recalibration. Given how monitors change with age and affect the display and your images, a monthly recalibration is recommended. Once the process is over, you can easily switch between a calibrated and uncalibrated view to compare the differences, and even drag your own photos in to see the before and after effect. You’ll instantly be relieved you took the time to calibrate when you see the noticeable differences in your images. For anyone who prints or displays their images, monitor calibration is a must. So don't do your images a disservice: make sure your monitor's calibrated, and your photographs are accurately capturing memories to treasure forever. *Online store prices in €. Exchange rates may vary. Visit Datacolor to find out more and take advantage of these savings.